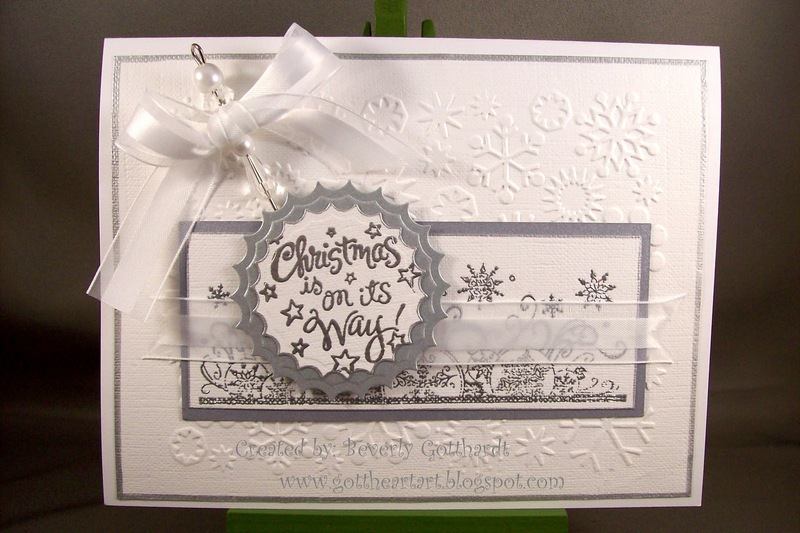 Supplies: White Card Blank 5" X 6 1/2" Halcraft, Papers: White textured card stock unknown, Stampin Up-Brushed Silver, Stamps: Hampton Art-Snowflake Horizon, Inkadinkado-Warm Holiday Wishes, Ink: VersaMark, CTMH Silver embossing powder, Cuttlebug embossing folder-Snowflakes, Spellbinders Nestabilities-Lg. 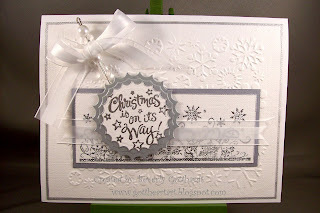 Classic Inverted Scalloped Circles, Stampin Up Pretties Kit, ribbon-Offray, Stampin Up dimensionals. Where we live, we wear coats every day in winter! Temps here have moderated a bit from single digits to the teens and twenties, but we have at least a foot of snow in our driveway from the latest storm with more on the way next week. In spite of being surrounded by white stuff, your card is lovely!